Breitling has entered the smartwatch race with a contender for the most desirable timepiece on the market...intoducing the B55 Connected. 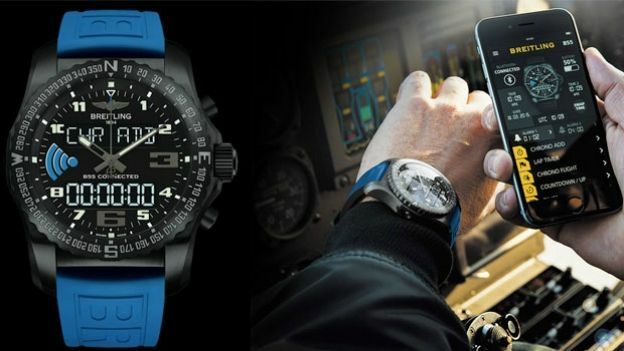 Breitling has taken the wraps off the B55 Connected, the company's debut smartwatch. The Swiss watch maker, which primarily designs and manufactures chronometer watches, takes a more simplistic approach with its first tech timepiece. The B55 Connected combines a traditional analogue movement with digital displays, so there's a little bit of old mixed in with the new. Rather than cramming loads of tech into it like the Apple Watch, which takes phone calls and receives text/email notifications, the B55 Connected offers features for a different clientele. Mainly aimed at pilots, the B55 syncs with the Bretling mobile app allowing users to alter the watch's time, set alarms and share timings all via their handsets. Its selling point however is its luxury Swiss design. The B55 features accurate timekeeping and the companys caliber superquartz movement, packed into a black carbon coated face and fitted with a rugged, blue strap. Breitling B55 Connected pricing and availability is still unclear, however details will likely be announced next week at the Baselworld show in Switzerland. Check out the promotional video below to find out more.